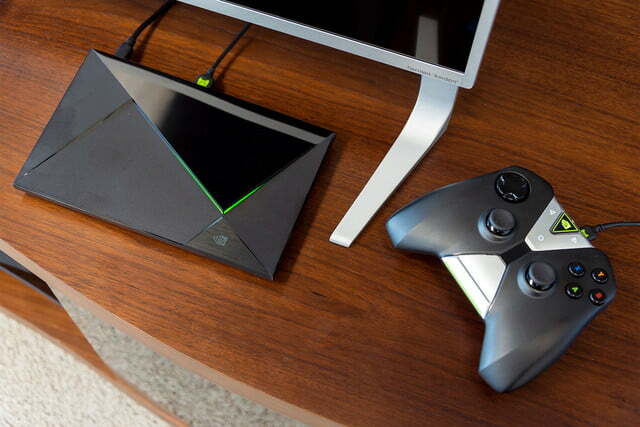 The nVidia Shield TV successfully straddles the line between streaming device and gaming console. 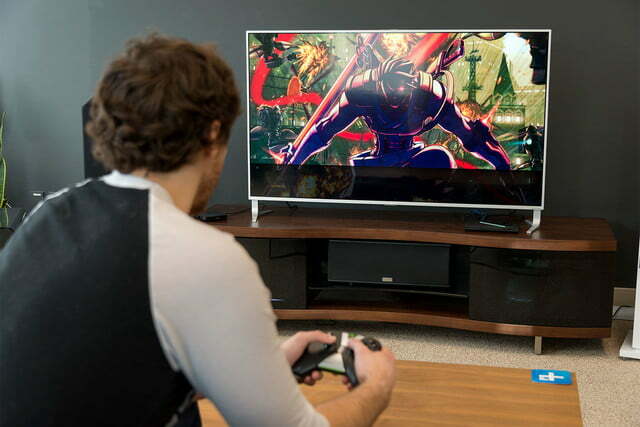 We build up our home entertainment systems for the best possible movie/tv and gaming experiences, and the list of equipment sitting under the screen tends to mount up quickly in the process. 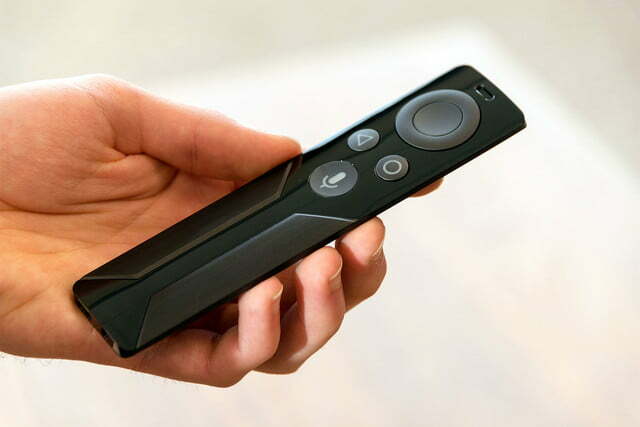 Lately, some set-top boxes have attempted to slim down the list of connected boxes by offering simple gameplay along with streaming movies and TV. The Apple TV and Amazon Fire TV both play basic games, but they pale in comparison to powerhouses like a PlayStation 4 Pro, Xbox One S, or a gaming PC. They simply aren’t powerful enough to offer gamers a rich experience while also delivering all the streaming content available today. Nvidia aims to change that. If you’re serious about gaming, and don’t already own a streaming box, then Nvidia’s Shield TV may be what you’re looking for. 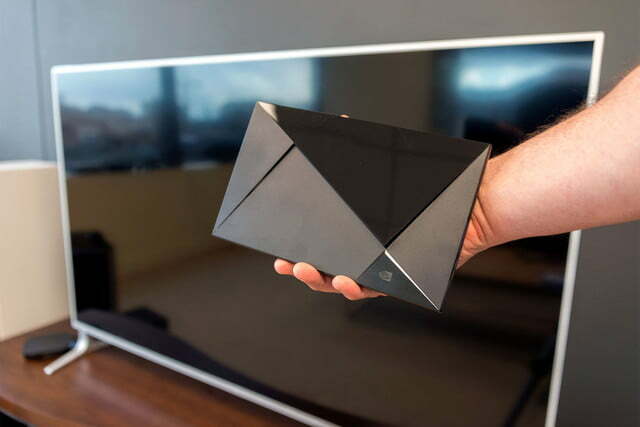 The Shield TV comes packaged in a sleek looking box that opens up to reveal a two-tiered plastic interior. 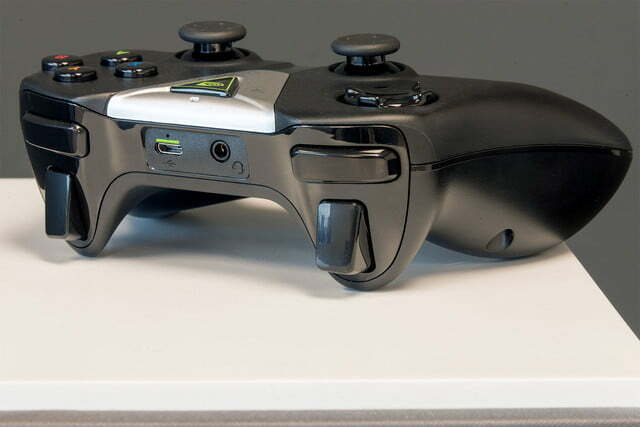 The top shelf holds the Shield itself, while the lower one houses the controller, HDMI, power, and USB charging cable. There are also warranty and setup guides included in the box. 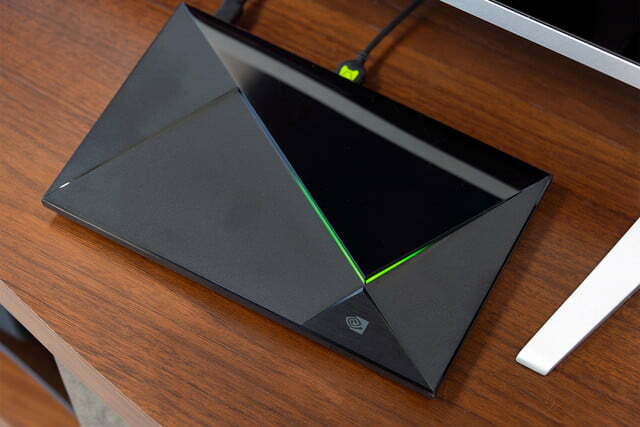 The Shield TV is smaller than modern gaming consoles, and certainly smaller than even the tiniest gaming PC, but it’s larger than most every other streaming box on the market. And the console itself is an interesting looking device. Most streaming boxes are just that: boxes. 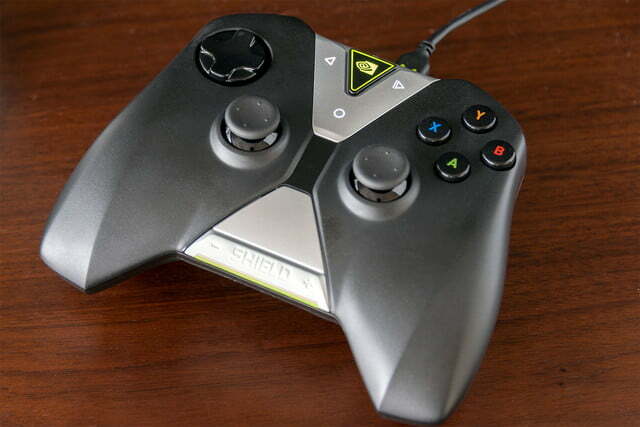 But the Shield features offset, intersecting angles in both its architecture and the style accents on the device itself. Sure, it’s still just a box, but it’s a visually arresting one. Just don’t plan to stack anything on it. The Shield TV’s major selling point is its ability to play and stream PC games to your living room TV, which it does very well. The included HDMI and power supply cables are adequate and should provide enough length to fit in most entertainment room setups. The USB charging cable for the controller is pretty small, however; you won’t be playing and charging your controller at the same time if your couch and your Shield are at opposite ends of the room. To do so, you’ll need to buy a longer, USB-to-USB-Micro cable. On the OS side of things, Shield TV runs the latest version of Android Nougat, which means the interface should be fairly familiar to most people. Google’s own apps use their Android TV counterparts, while most others — like Netflix or Vudu — look similar to what you’d find on game consoles or other streaming boxes. 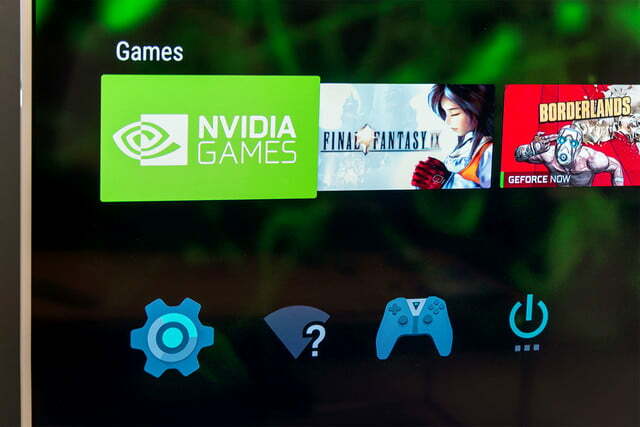 nVidia’s multiple gaming “apps” have been coalesced into a single “games” screen that also include the Android TV games app. This works relatively well, and makes accessing your installed games easy, but it can get confusing when juggling between multiple screens. Hooking the Shield to your TV is a simple process: plug the included power adapter into the back of the Shield and find a wall jack, then plug the included HDMI cable into the TV and the box. Optionally, you can connect the shield to your network via Ethernet, which we recommend. The better your internet connection, the better the Shield TV performs, so a hardwired Ethernet connection is best. That said, the Shield also works with Wi-Fi. The package comes with a USB cable to charge the controller, which you will likely need to do before you’re able to use it wirelessly. The major selling point of the Shield TV is its ability to play and stream games, and it does this quite well. There are three different ways the Shield TV can play games (and therefore, three different libraries). 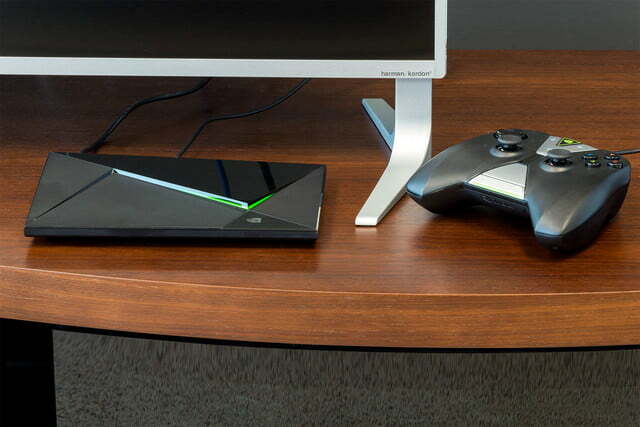 You can stream a game from the cloud through nVidia’s GeForceNOW service; stream from your PC using the GeForce Experience software; or play games installed on the Shield TV’s 16GB of built-in storage via the Google Play store. The controller is passable, but there’s more room for improvement than we’re happy to report. Of these, the most reliable is playing games installed directly on the device. The Google Play Store has a good number of controller-enabled games available for purchase, as well as free-to-play titles. These won’t be AAA blockbusters, but there are some gems, including Grand Theft Auto: Vice City Stories, The Walking Dead, Star Wars: Knights of the Old Republic, and a handful of classic Final Fantasy titles. These games all perform very well on the Shield TV’s Tegra X1 chip, and we never ran into any major graphical hang ups. The only real issue we had playing Android games on the Shield is that many use touchscreen control prompts instead of game controller prompts. This is a minor if annoying inconvenience, but it feels odd given how good our experience playing Android games on Shield TV was otherwise. Keep in mind that the Shield TV only has 16GB of storage, which is small, especially considering most smartphones have more storage than that (note: there is a 500GB version of the Shield TV available for $300). We didn’t run into much of an issue with this in several weeks of testing, but you may find that you need to delete games to make room for others after some time. Instead of a remote like you would find with most other streaming devices and set-top boxes, the Shield TV comes standard with only a video game controller. The overall design is not unlike an Xbox One controller, but with parallel thumbstick placement much like a DualShock 4. This may put off some who are only interested in a 4K streamer for movies and TV, as controllers are often overwhelming or confusing to non-gamers. That said, app and menu navigation with the Shield controller is simple, and the volume controls and fast forward/pause/rewind are all clearly labelled, making for an intuitive experience. The biggest complaint we have about the Shield TV controller is its low-quality buttons: The face buttons and dpad are mushy, the action on the triggers and shoulder buttons is almost inexcusably poor, the touch-capacitive buttons are easy to accidentally press during gameplay, and the volume buttons are clicky and feel cheap. The analog sticks are the only saving grace — they’re basically Xbox sticks with the parallel configuration of a PlayStation DualShock. There was no drift or deadzone, and the tension was consistent. The weight is good, and the size is decent, but the shape isn’t ideal. Even when streaming games to the Shield TV on a strong, stable connection, we still felt like we were wrestling against the controller. This is not to say the controller doesn’t work at all. Plenty of games, such as Final Fantasy IX or Oceanhorn — both of which feature less taxing gameplay and therefore do not need precise button input — played perfectly fine, and we were able to clock in some serious time with Borderlands and No Man’s Sky with only a bit of headache — or handache, as it were. 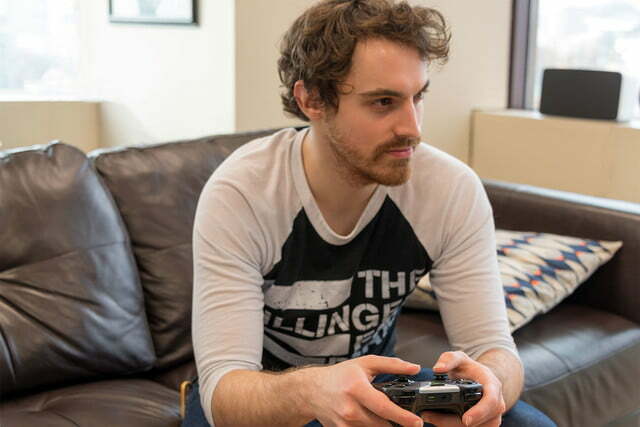 Technically there are workarounds to connect Bluetooth controllers like the DualShock 4 to the Shield, which would alleviate the issues of the Shield TV controller, but this requires a level of skill and desire to troubleshoot that exceeds what the general user will be comfortable with. You’re likely stuck with the standard controller. It’s passable, but there’s more room for improvement than we’re happy with. It’s obvious we have some serious misgivings about the controller, but in general, we enjoyed our time with the Shield TV quite a bit. As a set-top streamer, the Shield TV will provide you with 4K HDR content and all the popular apps you could want. But at $200, it doesn’t make much sense to work solely as a streamer; as a gaming peripheral, it better justifies the price. The network requirements may be high, but game streaming works well under ideal circumstances, and its Tegra X1 chip will tackle any games available on Google Play. It won’t (and shouldn’t) replace your PC, but it’s as an excellent peripheral and a good solution to bring your PC to your living room TV. For those looking at that 16GB capacity and wondering how the Shield TV could install, let alone play, the latest games — which often weigh in at 60GB or more — the answer is its streaming features, GeForceNOW and nVidia GameStream. With GeForceNOW, you can purchase a wide range of the latest games, which can then be played via cloud computing. Similarly, a $7.99 monthly subscription opens up a giant library of free games, including Deus Ex: Human Revolution, Hitman: Absolution, and Borderlands. The games available with the subscription model are good — some even great — but most are several years old, so don’t expect to pay a few dollars each month and be given access to the most recently released titles. It won’t replace your PC, but it works as a good solution to playing your PC on your living room TV. 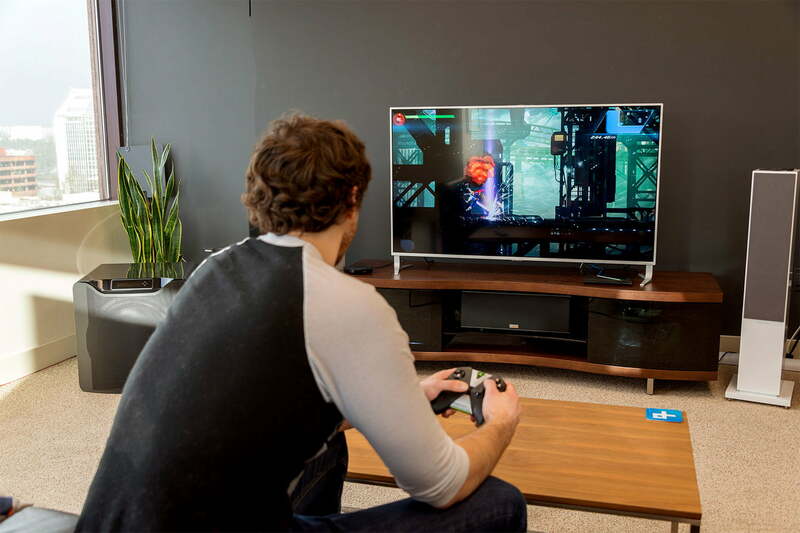 On the performance side of things, GeForceNOW can stream games with up to the same performance and visual quality as a dedicated gaming console. The service also offers the ability to play games via the cloud with remote GTX 1060 or GTX 1080 levels of quality, but it’s pretty expensive; after a free eight hours of play time, the price leaps to $25 for 20 hours with a 1060, or for 10 hours with a 1080. This requires a robust connection or your experience will suffer from latency, stuttering, and visual fidelity loss. It’s a cool feature, but we wouldn’t recommend paying that much to play. 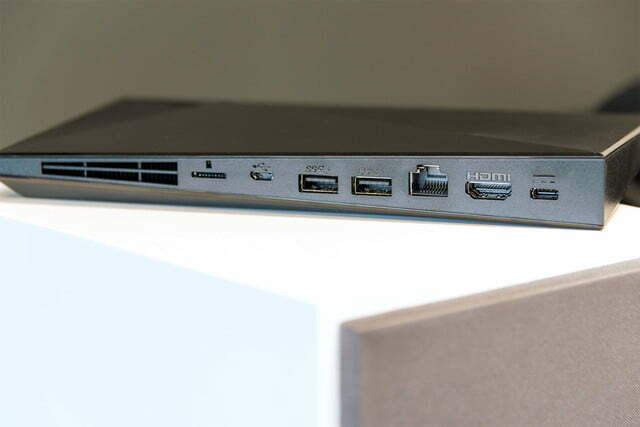 Finally, those with a gaming PC in their home can use nVidia GameStream to stream games. The setup is easy, but does take a few steps on both the Shield and your PC to enable the connection. Once the systems are linked, your entire PC library becomes open to you to play through the Shield. This was probably our favorite way to play. 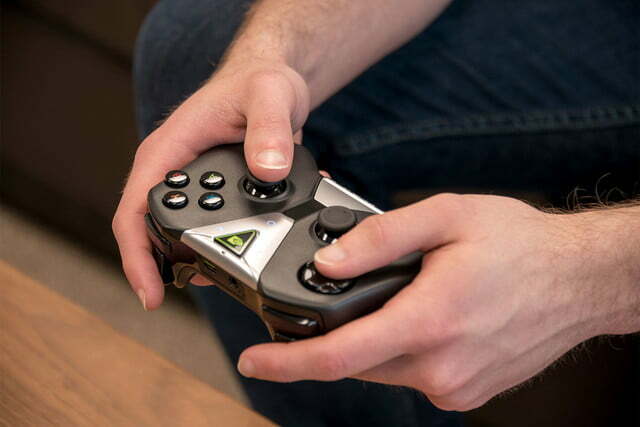 The Shield remaps the keyboard and mouse controls to your Shield controller in intuitive ways, but you can remap button inputs to suit your needs. Game performance will mostly be dependent on your PC’s hardware, but we noticed an appreciable difference in input latency with certain games, most notably Crysis 3 (which is pretty resource-heavy anyway). Whether you’re streaming via GeForceNOW or from your own PC, a very robust Ethernet connection is a must. We tested over both Wi-Fi and Ethernet to get a sense of what gameplay would be like in each instance. While playing over Wi-Fi is technically possible, we experienced severe packet loss, which means bad latency, stuttering, screen tearing, input lag, and graphical fidelity loss — in simple terms, your games will look bad, and control even worse. We also found that playback would drop entirely, without warning, should the connection become too unstable or fail in severe instances. The Shield TV can be a great way to play games, but if you value precision and performance, ensure your network can handle the stress. If not, it may be best to stick with your gaming PC or opt for a dedicated console instead. 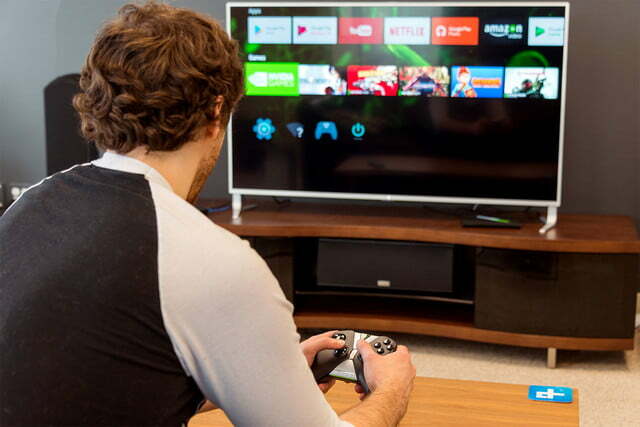 Much like with streaming games, image quality for videos on the Nvidia Shield depends on the strength of your connection and the capability of your TV or display. Even outside of its 4K HDR capabilities, the Shield TV is a well-performing streaming device. However, it’s still worthwhile to consider that with the most recent update to the Shield TV’s firmware, the system is now capable of 4K HDR video streaming. You’ll find 4K and HDR content in the apps you’d expect, such as Netflix, YouTube, Amazon, and Vudu. Again, the end-result is partially reliant on factors outside the Shield TV’s hardware, but the highly capable Tegra X1 chip handles the app-end workload extremely well, quickly accessing the selected content and beginning streams with minimal load time. Even outside of its 4K HDR capabilities, the Shield TV is a well-performing streaming device. Navigating the home interface and various apps are easy, and finding the content you want is simple. Text and voice search work well, and pull from content across any applicable apps installed. We found the voice recognition and voice commands to work very reliably, and rarely did we have to repeat or re-try searches. The Shield TV is good at streaming both 4K video and games from the cloud and your own PC. However, virtually every other video-only streaming device is cheaper. We’re fans of the Roku Premiere+, for example, which offers 4K and HDR at just $95 bucks. On the other side, the Shield is only a little cheaper than dedicated gaming consoles that are far more capable, and have wider libraries on their own. The PS4 Pro may be $430, but you can get a new Sony PS4 Slim for under $300. And then there’s the new Nintendo Switch, which is just $300 and offers a passel of interesting features. If you only plan to do one of these two functions, you’re better off getting a dedicated device. With only 16GB of internal storage, if you’re installing tons of apps or games directly into memory, you’re going to run out of space soon. At this point, most smartphones have more storage than this Shield TV model. You’ll probably want to upgrade the controller when possible, too. But the actual hardware is well built, and feels quite sturdy. Expect it to last for years. There are several caveats, but yes, the Shield TV is a good 4K streamer and great way to play your PC games. Plus, it saves you the backache of dragging your gaming rig into the living room.